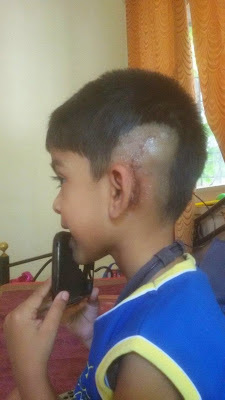 Aarav's journey to hearing......: What's that line on your head?? Its been 8 days post surgery and 3 days since the bandage was removed. We had kept Aarav at home these few days with just a few small bike or car rides around town. Aarav however misses his friends in the daycare a lot. So yesterday I dropped him at the daycare again. The lady who runs the daycare, asked what precautions should I take and I replied, just make sure that none of the kids touch near the head or touch the wound. Rest all is ok..
All other kids and Aarav too heard this and immwdiately all other kids started asking what happened to his head..
Chinmay, "Kay zhala ithe? Laglae ka"
Aarav pointed two fingers at him like a Victory sign and said, "Naai. Two machines ahe." Aarav turned his head around like an owl showing the old and the new, "Ithe ani Ithe. Atta aat taklae machine. Ear cha aat. Ithe haat nai lavaycha. Machine ahe"
Self Advocacy!!! And Aarav loves the fact that he now has two machines!! !